VALUE? Some chaps hold out for $1600 but it can show up at less than half that, with nasty exlib copies a little less. At present there is a fine copy at $400 om ABE that will probably sell unless the knife market is in shambles. The market in this book is indeed a little 'soft' as all copies except this have been sitting there since Summer '06. The $400 may be listed by one of those odd dealers who is actually trying to sell the book. $400 can come in handy especially if the book came in unremarked. STOP PRESS. The above was written in January 2007. The book seems to be still very much desired with the cheapest an ex lib copy at $550 ('usual library markings, otherwise clean and in very good shape...') and the most expensive at $2000 a copy with no real description -('may have price sticker on cover and very minor shelfwear...). These catchall descriptions save time and on $20 academic books are just about acceptable but for $2000 one expects a little desk work. Maybe the seller was a lawyer when he had a real job. A decent copy is now at least $800, possibly less for an eagle-eyed Ebayer. 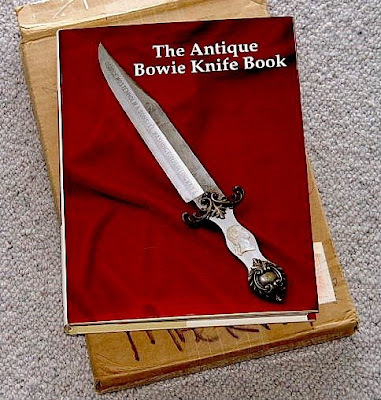 A guy with a copy at $1000 which appears to be one of a 100 (from the edition of 1100 copies) states '...with a history steeped in legend, the Bowie is the most famous of American knives. This book shows some of the finest Bowies extant, ranging from the knives of the backwoodsmen to showpieces made for the 19th century expositions and presented by royalty.' I assume from this that the knives were either given to royalty or given by them...anyway the book is alive and well and the $400 fine one at ABE has gone. That’s more or less the case: “David Bowie” was born David Jones and needed a stage name to distance himself from the Monkees’ Davy Jones. He choose Bowie (he pronounces it like Joey) after Jim Bowie and to a lesser degree, the knife. Source: Wikipedia.org--but I trust it on this point as I’ve read similar accounts elsewhere. We ran across your website and found more interesting on knife since we are also collecting them. Thanks for the information share, we will come back often. We ran across your website and found more interesting antique knife. Thanks for the information share. We will come back often.